Frank Harold Boyes was born in about mid 1898 [reg. Q3, 1898] in Rugby, the son of John Boyes, b.c.1858, in Willoughby or Rugby and Annie Marie, née Webb, Boyes, also b.c.1858, in Lawford or Rugby. Frank was baptised on 11 September 1898 at Saint Andrew’s Church, Rugby. On that same day Charles Henry Bland was baptised – they later lived only about three minutes walk apart and they would join up together and die together on the first day of the Battle of the Somme. When he was baptised, the family were living at 11 Worcester Street, Rugby, and his father was an ‘LNWR Driver’. In 1901, they were still living at 11 Worcester Street; Frank was about two and the youngest of six children then at home – his father was a ‘railway engine driver’. By 1911, the family had moved to live at 84 Railway Terrace, Rugby. Frank’s parents had been married 31 years and had had 9 children, of whom eight had survived. His father was still a ‘Railway engine driver’; three sons were still at home, with Frank, aged 12, still at school. Frank Harold Boyes – photo by permission of Rugby Library. 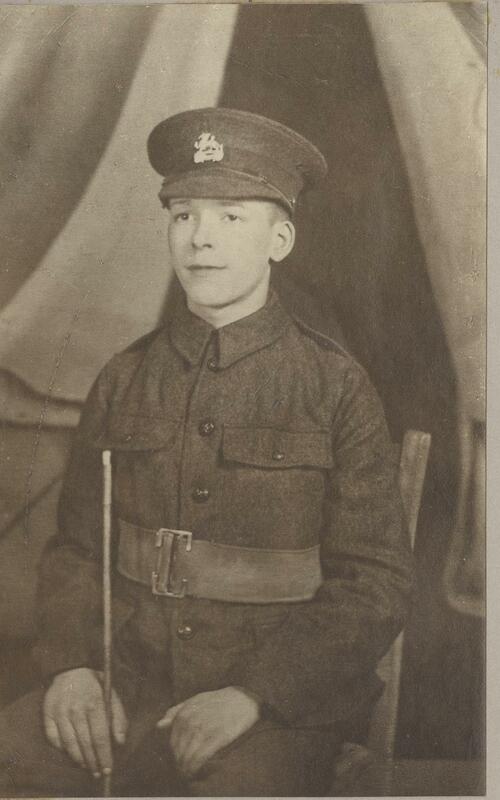 Frank Boyes first enlisted on 7 September 1914, at Rugby, claiming to be exactly 19 years old, and a machinist. He was attested as No.1276 into the 2nd Company, Kings Royal Rifle Brigade. His attestation papers shows that he was 5ft 43/8 inches tall. However, with his birth registered in Q3, 1898, thus no earlier than mid-May 1898, he was only [just] 16 years old and two days later, on 9 September 1914, he was discharged under ‘Para 392 (ii)’ as ‘under standard’. Paragraph 392 of the 1912 edition of King’s Regulations contained the official causes of discharge: ‘(ii) Having been irregularly enlisted’ – in his case, being under age. His army pension record, which survives, confirms his three days’ Home Service! Frank seemed determined to serve his country, and before the end of June 1915 – probably well before – Frank Harold Boyes enlisted as Private, No.16937, in the 2nd Battalion of the Princess Charlotte of Wales’s (Royal Berkshire) Regiment on the same occasion, and just after his friend, Charles Henry Bland, who was enlisted as No.16936. The date of enlistment is unknown. The 2nd Battalion of the Royal Berkshire Regiment was a Regular Army unit and was serving in India on the outbreak of war and was recalled to Britain, where, with other Regular units also stationed abroad, it helped form the 25th Brigade and was attached to the 8th Division. They came to the Western Front in late 1914 and arrived at Le Havre on the 5 November with 30 officers and 978 other ranks. Their first job was to relieve the 1st East Surreys in trenches at Fauquissart and there they suffered terribly from trench foot and other illness’s caused by the abrupt change of climate. The next three months were spent in and out of trenches including Christmas day when they took part in the Christmas Truce. The War diaries for the 2nd Berkshires are available, although they would not be expected to include individual soldier’s names. Frank’s Medal Card does not have a date when he went to France, presumably it was after training in UK, and he probably arrived there on the same date as his friend, Charles Henry Bland, on 30 June 1915. The battalion diaries can be sampled to find the activities of the battalion. The opening of the Battle of the Somme produced a more detailed diary entry. 1 July 1916, ‘Attack on OVILLERS. The Battalion took up its assembly position in accordance with Brigade Operation Order No. 100. The 2nd BN LINCOLNSHIRE REGT was on the left and the 2BN DEVONSHIRE REGT on right. Our own wire was not sufficiently cut and parties were immediately sent out by Companies to clear it. At 6.25am the intensive bombardment began as scheduled. At about 7.15am the enemy opened rifle and machine gun fire on our line; this fire was probably drawn by the 2nd DEVON REGT which at about this time attempted to line up in front of their parapet. At 7.20am Companies began filing down trenches and getting ready for the assault. At 7.30am the three assaulting Companies advanced to attack the GERMAN line. They were met by intense rifle and machine gun fire which prevented any of the waves reaching the enemy lines. A little group on the left of the Battalion succeeded in getting in, but were eventually bombed out. At about 7.45am the COMMANDING OFFICER (LT COL A.M. HOLDSWORTH) and SECOND IN COMMAND (MAJOR G.H. SAWYER DSO) were wounded in the sap on the left of our front, the COMMDG OFFICER handed over Command of the Battalion to 2nd LIEUT C. MOLLET (ACTG ADJT) by this time the parapet was swept by rifle and machine gun fire which prevented any exit from our trenches. The enemy replied to our intensive bombardment by barraging the front line from about 6.35am onwards. No message was received from other Battalions in immediate vicinity. At about 11am the order came from Bde Headquarters to “stand by” and await further orders. About 200 men of the Battalion were collected on the right of the front line and in the assembly trenches off ULVERSTON Street. At about 12.30pm news was received that the Brigade would be relieved. At about 3pm Major Hon R. BRAND, 2nd Rifle Brigade arranged to take over all the front line and with the sanction of the Brigade the Battalion was withdrawn to RIBBLE STREET. On relief by the 37th INFANTRY BDE, the Battalion marched back to bivouac in LONG VALLEY. TWO LEWIS GUNS were damaged, Steel Helmets proved invaluable and in numberless cases saved mens lives. The following casualties occurred amongst Officers. KILLED IN ACTION.- LIEUT A.J.G. GOODALL. 2nd LIEUT S.S. SCHNEIDER. DIED OF WOUNDS.- LT COL A.M. HOLDSWORTH. WOUNDED.- MAJOR G.H. SAWYER DSO. CAPTAIN B. HAYE. CAPTAIN J.A. CAHILL. LIEUT W.C. ADAMS. 2nd LIEUT W.S. MACKAY. 2nd LIEUT J.V.R. OWEN. 2nd LIEUT R.G. GREEN. 2nd LIEUT W. GALE. MISSING. CAPTAIN H.T. ROWLEY. CAPTAIN R.C. LEWIS. LIEUTENANT B.S. ROBINSON. LIEUT O.G. PAYNE. 2nd LIEUT H. GODFREY. 2nd LIEUT B.H. BELCHER. 2nd LIEUT P.G. SHIRREFF. 2nd LIEUT M.I. HEMING. 2nd LIEUT S.H. BEDFORD. OTHER RANKS:- 33 KILLED. 3 DIED of WOUNDS. 260 WOUNDED. 118 MISSING. Frank Harold Boyes was one of those killed or missing, and his body was not found or identified and he is remembered on Pier and Face 11 D. of the Thiepval Memorial. He is also remembered on the Rugby Memorial Gates. Frank Harold Boyes was awarded the British War Medal and the Victory Medal, and although it is not mentioned, probably the 1914-1915 Star. Frank’s sole legatee was his mother, Annie M Boyes, who received £5-14-3d on 9 August 1917, and £5-10-0d on 10 October 1919. This article on Frank Harold Boyes was researched and written for a Rugby Family History Group [RFHG] project, by John P H Frearson and is © John P H Frearson and the Rugby Family History Group, June 2016. Their Service Records have not survived, and the Berkshire’s numbering is not readily usable to approximate attestation dates. The Wardrobe, The Rifles Berkshire and Wiltshire Museum, http://www.thewardrobe.org.uk/home. This entry was posted in Biography and tagged 1916, Battle of the Somme, Boyes, Royal Berkshire Regiment by Christine. Bookmark the permalink.